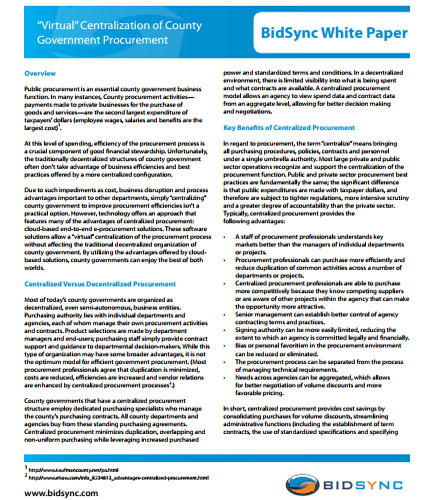 "Business Disruption and Process Advantages"
Public procurement is an essential county government business function. In many instances, County procurement activities npayments made to private businesses for the purchase of goods and service are the second largest expenditure of taxpayers’ dollars (employee wages, salaries and benefits are the largest cost) At this level of spending, efficiency of the procurement process is a crucial component of good financial stewardship. Unfortunately, the traditionally decentralized structures of county government often don’t take advantage of business efficiencies and best practices offered by a more centralized configuration. Due to such impediments as cost, business disruption and process advantages important to other departments, simply “centralizing” county government to improve procurement efficiencies isn’t a practical option. However, technology offers an approach that features many of the advantages of centralized procurement: cloud-based end-to-end e-procurement solutions. What is Procurement Operations ? Procurement operations, as the name suggests is the act of procuring or obtaining goods and services. The process can entail preparation, like, homework and research, and dealing with the requirement, in addition to, handling end receipt and payment approval. Though it sounds easy, one should not forget that the act of procuring for a company demands meticulous processing. It is important that the funds, both public and corporate, are managed responsibly, irrespective of the economic situation. Though serving an essential role in company operations, procurement operation can be misjudged and misquoted under maintenance and strategic planning.